I've been working on this Deathwing Venerable Dreadnought for a little while now as I try and steal a little bit of hobby time here and there. He goes with the five-man Deathwing squad I did last year. He's not "legal" in the sense that these options can be fielded in a regular game of 40k, but he's built to look cool and look like he's outfitted for Space Hulk work. If a chainfist and heavy flamer are good, then a bigger chanfist and a bigger heavy flamer are better. There's 40k logic for you. He's painted using the same blending technique I used on the squad. Light grey prime, blend of light grey and GW Dheneb Stone for the armour plates. The rest is weathering over various types of metal on the model. I did use the heat stained barrel technique on the Inferno cannon. The base comes from the same line the squad is is on (Flight Deck series). They come from Secret Weapon Minis. I used the same wash/drybrush technique as well so everything matches. 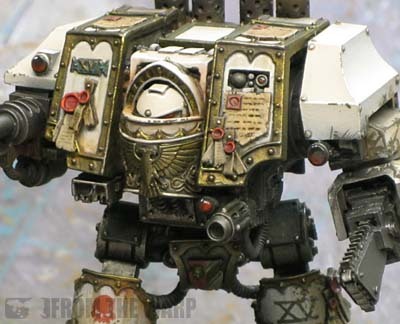 When it came to markings, I tried to stay close to what I could find in the Imperial Armour books as far as markings. Given that this guy is venerable and is already covered in purity seals and scrolls, I didn't have much free space left. The chapter symbol went on the right shoulder, a campaign badge on the lower right leg and his number on his lower left leg. The number is also repeated on the small brass plate on his right torso. Using brass etch made that little addition a breeze. I do have to let him sit for a day and give my eyes a rest. I'll come back to him and work on some small details here and there and then he'll be completely done. Here's a link to the huge WIP post I compiled. Just gorgeous. The brass trim looks fantastic and I am blown away (as usual) by what you are able to do with this stuff. Very, very nice! He looks fantastic. I'm with Krisken in that the brass looks amazing. Also, I really like how the grey looks! I rather like all of the scraping on the arm behind the chainfist, nice touch! Thanks folks! He still needs some final nit-picking, but other than that, he's all done. I just need to put him down for a day and take a break. When I come back to him, I suspect I'll find a couple little things here and there to fix. I never really thought about a Dread being used for Space-Hulk work, but the concept is great. 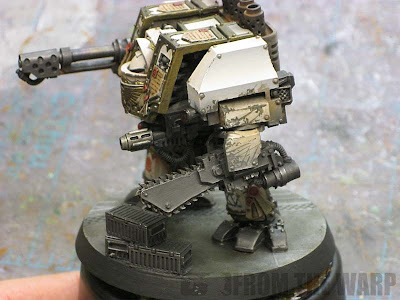 I was undecided about getting one of the regular FW Vernable Dreadnought torsos to make a Mortis with, but you've sold me on that with these pictures. And I'm with the others on wanting to know how you did the brass/gold trim. So are you finally painting up an army for yourself Ron? Hopefully we can look forward to battle reports of these guys using the new FW rules. 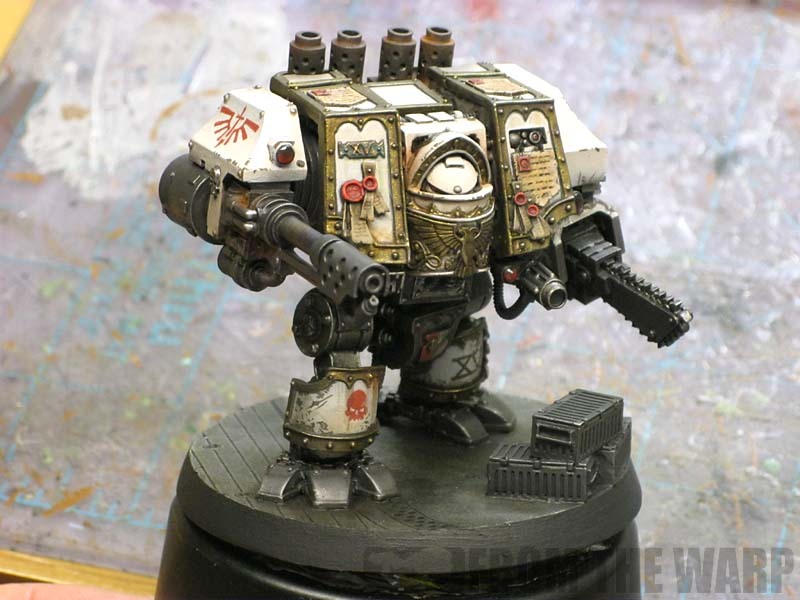 The weathering job on this dread makes it for me. Nice job! Ron, I tried asking this in the previous thread but I think I was a little late to the party. Your Deathwing series has finally got me working on the Deathwing army I am starting. I have found airbrushing from above to be an easy way to add a zenital color (with grey knights). 2. Add Zenital Dheneb or Vallejo Warm Grey from above w/ airbrush. 3. Dark Grey non-bone areas. My only worry is that if I wash after the zenital coat, the warm color will be darker. Maybe I should use a lighter color to begin with (bleached bone?). Anyway, your thoughts would be greatly appreciated. Gorgeous! I've been holding back from my DA Venny for a while. Now you've got me motivated! Looks great. Really like the white and the weathering. The chainfist looks a little 'flat' being all one colour but it doesn't take away how good the whole thing is. 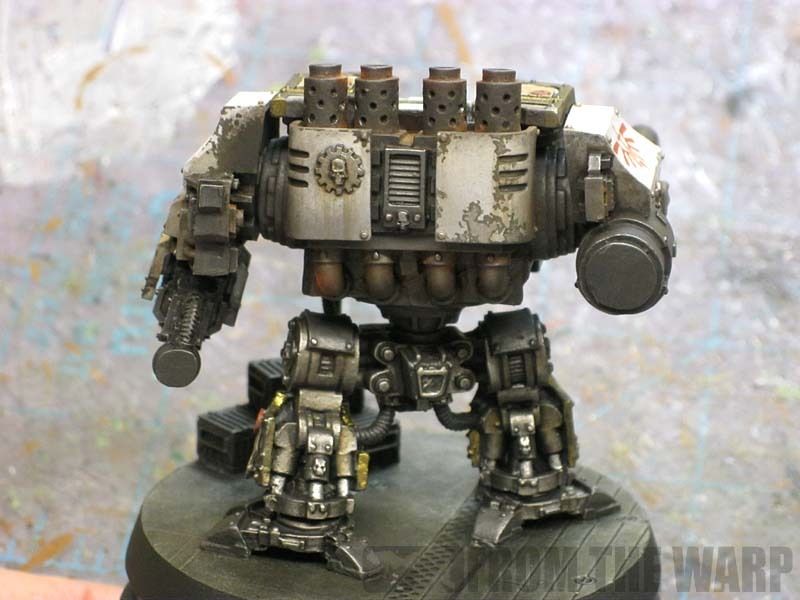 Sendraks: I could dreads being used in the larger areas as support for Terminator squads. They are restricted in where they can go, but would still be of great help in clearing certain areas of a hulk I'm sure. The brass/gold trim is easy enough to do. It's a basecoat of P3 Blighted Gold over the dark grey color (as talked about in the squad tutorial). Once that dries, it's washed with Devlan Mud and then Gryphonne Sepia. The highlighting on it is a quick pass with a metallic weathering powder and a pencil for emphasis. Drathmere: You've sold me on Ultramarines. I won't have a Deathwing army for a long time. I might use the rules, but my next force will be the boys in blue. Christian McClellan: I think you're right about the wash darkening the warm portions. You could be very selective in applying your wash and that might help. I think going with a lighter color won;t help though as the trick with this is the warm and cool colors are the same value. But... you never know, try it out, maybe you could create the airbrush version of this technique. Fonkin: Good luck then! Glad this pushed you that last little bit to get going. Rictus: Thanks, And you are right about the chainfist. It is one of the areas that I will go back into. A little bit of bright silver to define the teeth and some major, recent gouges in the shroud should be enough to bring it to life. Thanks Ron, as soon as I get some plastic ill send in pics of a test mini. To be honest, the more I think about it the more I confuse myself. Maybe I don't understand value, but if Dheneb and the grey are the same value, and the wash darkens them both to a degree, will they not still be the same (if somewhat darker) value? Christian: The technique has the base of grey done and then the wash before the Dheneb stone. The wash is for the recessed areas. After that, you go back and blend each plate using the grey and stone colors without altering. So... the wash darkens the initial base of grey. it's not over the grey/stone blend you do afterwards. Absolutely epic weathering. I like it a lot. Really nice work, like what you've done for battle damage. Ergotoxin and Warflake: Thanks guys! He looks absolutely fantastic. I really like the whites, so damn smooth. I've never painted white that smooth without an airbrush! Only thing I want to point out is that I prefer the mechanicus logo for be the black and white version rather than the background color. Flekkzo: Thanks! I see what you mean about the logo. I was thinking of it more like a metallic stamp or casting that was added to the back of the engine. yeah thats pretty much awesome!. really like the weathering. GavCee and Todd Sherman: Thanks guys! I haven't found anywhere that you'd mentioned using P3 metallics...? "The brass/gold trim is easy enough to do. It's a basecoat of P3 Blighted Gold over the dark grey color (as talked about in the squad tutorial). Once that dries, it's washed with Devlan Mud and then Gryphonne Sepia. The highlighting on it is a quick pass with a metallic weathering powder and a pencil for emphasis." I ask because I understand the P3 metallics to be 'less than' GW ones. Is this true? Marshal: What do mean "less than?" @Ron The black/white logo looks so striking that I can't help but paint it that way :) I also like putting the chapter (legion) symbol on the other side if possible. Drop pods are quite good for getting those imp fist logos:) Unfortunately those are too big for dreads, but works wonders for LRs. Flekkzo: I agree, the black and white is striking. The way I figure it, it's like sporting the logo from the car dealership on your car. You only do it because it came on the car when you bought it and you can't get it off your car without upsetting someone. If the Deathwing had it their way, they'd probably take the thing off and replace it with their own iconography if it wouldn't upset someone. By less than, that they are not as obedient or as nice as GW metallics. Marshal: I only have experience with GW Boltgun Metal so my perspective might be skewed. As far as comparing the P3 Blighted Gold to that though, it (the P3 metallic) is only slightly less in terms of quality. Not much though... I'd say they were closer more than they were different. But... my experience with P3 metals is limited as well. Come to think of it, I'm probably not the person to ask. Marshal: It's my basic metal color that i work from. I use a lighter (silver) color for highlights when needed. If I want it darker or I want it to have a different tone, I'll use additional washes. As for gold, it's the P3 Blighted Gold color most of the time since I just like the look. I have some brand-X gold colors and the GW golds as well. Again, they are washed for effect (Sepia, Devlan Mud, purple, green, etc) depending on what effect I want. Bronze and copper start as GW Tin Bitz and I have a lighter brand-X color I use for the highlight. I should look at going over all these in a post now that you ask about them. It's interesting as I sit here thinking about what and how I use them. Ok, That's pretty darn sharp! Your weathering is really inspiring. I especially like how the close combat arm has extra damage to it as would see more physical use. Brilliant attention to detail. This inspires me to attempt weathering techniques more. shawn: Thanks! I try to incorporate as many little things like that as I can. Maybe I'm a little late, but I still hope you read this. 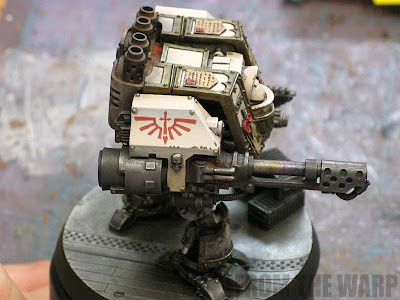 How did you do those fantastic metallics, especially on the flamer's canister? The canister is mostly metallic weathering powder over a flat black basecoat. To get a sharper edge highlight, I go back with a pencil and highlight the edges.